Put on some goggles and go nuclear! Bombard atoms with particles to create chain reactions in this high-energy puzzle game!Gone fission?Put on some goggles and go nuclear! 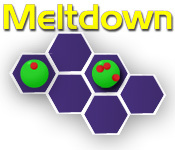 Bombard atoms with particles to create chain reactions in this high-energy puzzle game! Try to explode as many atoms as possible with the fewest particles. Chain reactions of four or more grant bonus particles. All the fun of atomic fission without all the radiation!